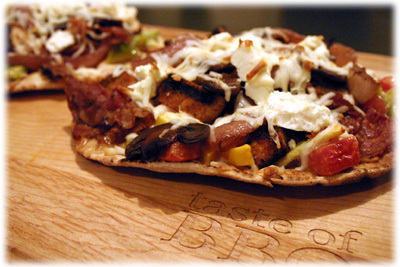 Have some fun with this gourmet Chicken Pizza recipe especially designed for the grill. 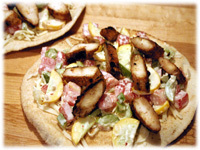 Let your guests make their own personal grilled pizza's using any combination of ingredients you provide, along with the sliced Cajun grilled chicken breast. 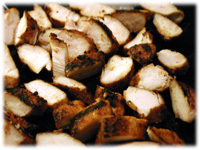 The chicken is rubbed using our special Cajun seasoning recipe which takes less than 5 minutes to put together. The 8" pita makes a nice crisp thin-crust pizza and can be cut into smaller pieces for a great appetizer or served whole as a personal pizza. If this isn't what you're looking for how about our traditional BBQ Chicken Pizza recipe or this Alfredo Grilled Vegetable Pizza recipe. Variation: Use any combination of your favorite vegetables with this chicken pizza recipe. 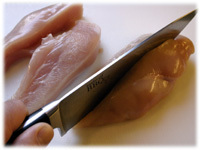 Slice each chicken breast lengthwise in half. 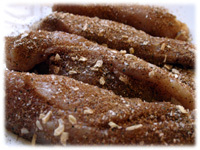 Rub each piece with Bobby B's Cajun seasoning recipe so their completely covered. 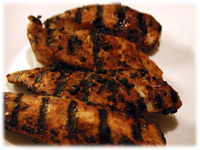 Preheat the grill to 500F and grill the Cajun rubbed chicken breasts for 7 - 10 minutes until cooked (160F internal temperature). Sliced the cooked chicken into bite-sizes pieces. Saute the sliced mushrooms in 1 tablespoon butter or oil. When their nearly cooked and browning, pour 2 tablespoons red cooking wine (Marsala) and continue cooking until reduced. 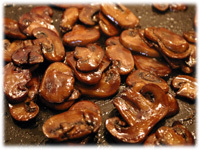 Pour 2 tablespoons balsamic vinegar over the mushrooms and continue to cook until reduced. 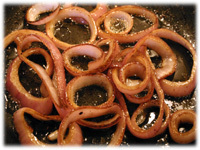 Saute the onions in butter until browned and softened. 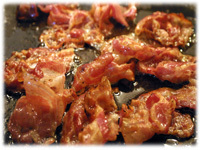 Fry Pancetta bacon (or regular bacon) until crisp. Remove and drain on paper towels. Set aside. In a small bowl prepare the veggie sauce described above. Dice the vegetables and stir into the sauce mixture. Lay the pita bread on a clean working surface. Sprinkle 1/4 cup shredded mozzarella cheese over each piece of pita. 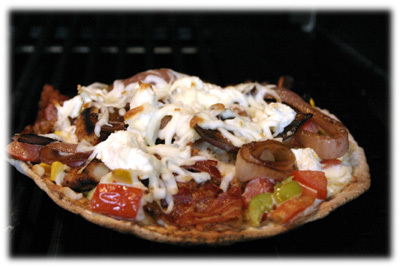 Place some of the veggies and sauce over the mozzarella cheese on each pita. 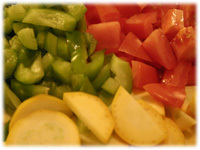 Arrange some of the Cajun chicken breast with the veggies and sauce. 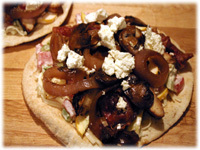 Add some sauteed mushrooms, onions, bacon and larger chunks of crumbled feta cheese on each pizza. Top the pizza with another 1/4 cup of shredded mozzarella cheese. Preheat the grill for indirect grilling to 400F - 450F. Place each pizza on the grill (not over direct heat) and close the lid. Every several minutes lift the lid and give the piece a 1/4 turn to ensure all sides get evenly cooked. 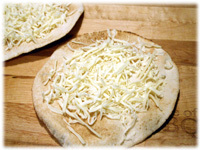 Once the mozzarella cheese begins to melt and brown (7 - 8 minutes) and the pita is nice and crisp it's time to remove the pizza. Slice into smaller pieces for appetizers or plate each pizza, one per person.